Although the calendar may not say it, in California summer season has started. For many, those long-awaited vacation plans are drawing near. While some may be sticking around and enjoying barbeques and visits to that special local spot, others may be in store for a road trip to their favorite destination. Whatever your summer plans may include, California’s roadways are sure to be bustling. With this in mind, the California Office of Traffic Safety is reminding drivers to make this summer a fe one by planning ahead for a stress-free and enjoyable trip, no matter the distance. your trip, and make others aware of your plans. Figure how long it should take to reach your destination, then give yourself extra time. inflated and treads are in good condition. Confirm that lights and wipers are working properly, and clean windows ahead of time. for a complete list of suggested contents. Buckle up, and require that all passengers do the same. possible. It is unsafe to perform repair work on the freeway shoulder. call 911. You could save your own life and the lives of those around you. with proper car seat installation, visit www.ots.ca.gov/Child_Passenger_Safety.asp. pack plenty of snacks and cold drinks – including water – especially in the heat. over to a safe place, such as a rest stop. pull over to a safe place. Share driving duties with other passengers, and get plenty of rest prior to your trip. While it is important to eat and drink, do not do these things while behind the wheel. 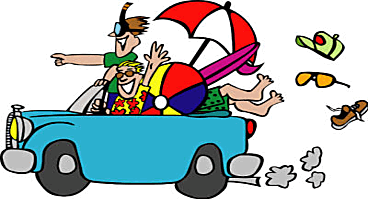 The California Office of Traffic Safety wishes you a safe, fun, and memorable summer.